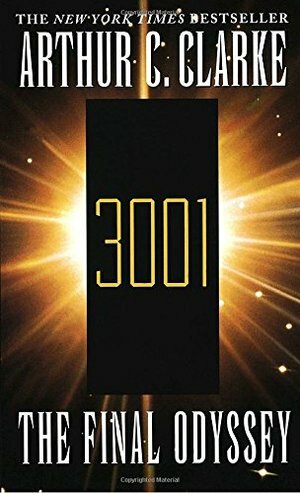 Book Description One thousand years after the Jupiter mission to explore the mysterious Monolith had been destroyed, after Dave Bowman was transformed into the Star Child, Frank Poole drifted in space, frozen and forgotten, leaving the supercomputer HAL inoperable. But now Poole has returned to life, awakening in a world far different from the one he left behind--and just as the Monolith may be stirring once again. . . . A Main Selection of the Science Fiction Book Club® Selected by the Literary Guild® and Doubleday Book Club® Editorial Reviews From Library Journal In this fourth and final book in a 30-year publishing odyssey (following 2001, 2010, and 2061), 2001 astronaut Frank Poole, presumed dead and adrift in deep space near Jupiter, is recovered alive in the year 3001. Intent on saving humanity, he returns to Jupiter's satellite, Europa, to contact partner Dave Bowman, whose mind has become absorbed by a third monolith. Unfortunately, Clarke uses this book as a vehicle to showcase scientific ideas and breakthroughs at the expense of the story, spending too much time catching up Poole on what he's missed in the last 1000 years while failing to develop fully the current situation and rushing the conclusion. Recommended only to complete the quartet. Copyright 1997 Reed Business Information, Inc. --This text refers to an out of print or unavailable edition of this title. From Booklist At the opening of the third millennium, humanity is spreading --This text refers to an out of print or unavailable edition of this title. "Would you argue that anyone with strong religious beliefs was insane?" Is there anyone reading who hasn't been offended in one way or another yet? But none of that is as insulting as the awful, awful, awful writing and story in 3001. Once again, Clarke demonstrates his talent for creating boring characters who don't do anything interesting or important. In this story, the body of Frank Poole is recovered from the far reaches of the solar system, and--surprise!--he's still alive (and in perfect hibernation, to borrow from Lando). The reason for Frank's return is that Clarke needed Heywood Floyd but couldn't think of a way to make Floyd live till 3001. So he brought Heywood back, but now called Frank Poole. But even if the philosophical outlook was insulting and the characters were bland, there was still a chance that the plot might have been intriguing. But no. The ultimate resolution of the monolith mystery is that we never know for certain anything about the Firstborn. And then everything is solved with a hard drive full of computer viruses. Seriously. Oh, and Clarke does his gimmick of reusing entire chapters from previous books. So every now and then I would be reading, and suddenly think, "Wait a minute--is this that same chapter again??" Yes: it happens five times in 3001.